In 100 Words: What do you seek? Assurance that the Golden Age comedy of remarriage has survived, even amid the twilight of marriage itself, as has Preston Sturges's legacy of delectable comic satellites? Are you jonesing for Howard Hawks's ethos of the workplace as an incubator of absurdity, philosophy, growth, and seductive opportunity? Do you enjoy a good puzzle? 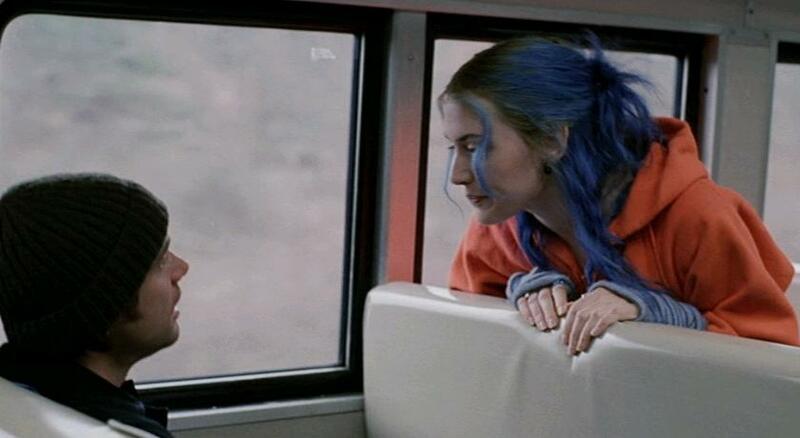 Were you wondering if modern Hollywood can accommodate surrealism, or if anyone in the age of digital photography could compose a frame around smears of colora blue mane, an orange hoodie, two scarlet pigtails? Are you an incorrigible romantic? An agnostic one? Okay? Okay. Food for Thought: Eternal Sunshine is a film that has percolated in a lot of books and articles that have crossed my desk and, at least briefly, in several conference papers I have heard, but I have never applied myself to seeking out a favorite article, or one to assign alongside the film. The one that I remember being eye-opening and graceful in teasing out the philosophical discourses in the filmboth its echoes of ideas from canonical philosophers and its own conceptions about memory, thought, ethics, and lovewas Christopher Grau's article "Eternal Sunshine of the Spotless Mind and the Morality of Memory," published in the Winter 2006 issue of the Journal of Aesthetics and Arts Criticism (64.1): 119-33. It's a very engaging read, though I'm sure there are others, and am even surer that scholars and smart fans will keep taking cracks at this one. I also heartily endorse David Martin Jones's remarks on Eternal Sunshine in his monograph Deleuze, Cinema, and National Identity (Edinburgh University Press, 2007), though you'll want to read the book straight through, and possibly Deleuze's Cinema books ahead of time, in order to fully dig it. Disclaimer: Eternal Sunshine was included in the most recent revision of my parallel Favorite Films feature. It will now have to come out, since the idea of that second list is to highlight personal pets that don't appear on this roster of Bests.